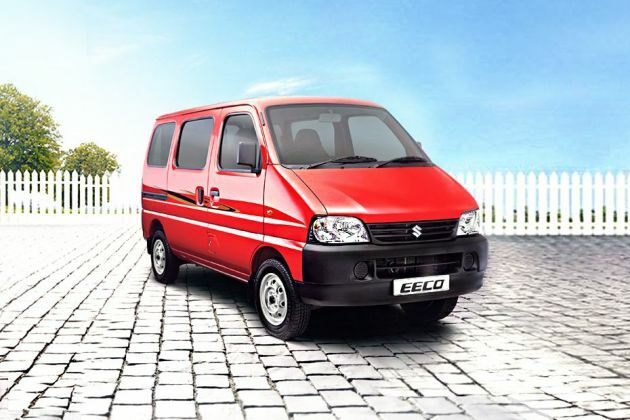 Maruti Eeco is a spacious MPV from the stable of India's largest car maker, MSIL. It is available in both petrol and CNG fuel options for the buyers to choose from. Among the several variants, Maruti Eeco 5 Seater AC is the top end trim in its petrol engine line up. It is blessed with a 1.1-litre engine, which comes with a displacement capacity of 1196cc. The braking and suspension mechanism is quite efficient and keeps the vehicle well balanced. The front wheels are equipped with ventilated discs, while the rear gets drum brakes as well. On the other hand, the front and rear axle are assembled with McPherson strut and 3-link rigid type of suspension mechanism. The insides have a few standard features like an air conditioner with heater, sun visors for driver and front passengers, an advanced instrument cluster and many other such features. Its overall dimensions are quite standard and easily accommodates five passengers. It is designed with an overall length of 3675mm along with a total width of 1475mm, which includes external rear view mirrors. It has a height of 1800mm, wheelbase of 2350mm and a minimum ground clearance of 160mm that is rather decent. This radiator grille is flanked by a well lit headlight cluster powered by high intensity halogen lamps and turn indicator. It has a black colored bumper, which is fitted with a wide air dam for cooling the engine. Coming to its side profile, it comes with door handles and outside rear view mirrors, which are in body color . The neatly carved wheel arches are fitted with a sturdy set of 13 inch steel wheels. These have center hub caps and 155 R13 LT sized tubeless tyres and mud flaps for the front wheels only. On the other hand, the rear end is designed with a large windscreen, which is integrated with a high mounted stop lamp. Apart from these, it has a bright tail light cluster, black colored bumper and a boot lid with company badging. The company is selling this MPV in quite a few exterior paint options like Metallic Glistening Grey, Silky Silver, Midnight Black, Blue Blaze, Bright Red and Superior White with metallic finish option for the buyers to choose from. The interiors of Maruti Eeco 5 Seater AC trim are quite spacious and is incorporated with a number of practical and utility based aspects. It is equipped with well cushioned seats, which are covered with fabric upholstery. The dual tone dashboard is equipped with features like glove box, three spoke steering wheel with a company logo in the center and a digital display with a few notifications for convenience of the driver. The dual tone internal section comes with molded roof lining and floor carpet, which gives it a decent appearance. Apart from these, it is bestowed with sun visors with driver side ticket holder, assist grips for co-driver and rear passengers, front and rear cabin lamps for easy access and it also has a spacious boot compartment that can take ample luggage. This variant is powered by a 1.2-litre petrol engine, which is integrated with four cylinders and sixteen valves. This double overhead camshaft based power plant has the ability to displace about 1196cc . It is cleverly mated with a five speed manual transmission gear box, which distributes the engine power to its rear wheels. This engine can churn out a maximum power output of 73bhp at 6000rpm in combination with a peak torque of 101Nm at 3000rpm. This utility vehicle can attain a top speed in the range of 140 to 146 Kmph, which is rather decent for this segment. At the same time, it can cross the speed barrier of 100 Kmph in close to 15.6 seconds. With the help of multi point fuel injection supply system, this MPV can generate about 15.1 Kmpl on the bigger roads, while delivering 11.8 Kmpl in the city traffic. This vehicle comes with a proficient suspension and braking mechanism, which keeps it well balanced at all times. The front axle is assembled with a McPherson strut, while the rear axle is fitted with a 3-link rigid type of suspension mechanism. The company has given this trim a rack and pinion based manual steering system, which is quite responsive. This steering wheel supports a minimum turning radius of 4.5 meters that is quite good for this class. On the other hand, its front wheels are fitted with a set of ventilated disc brakes, while the rear wheels are equipped with conventional drum brakes. The car manufacturer has bestowed this Maruti Eeco 5 Seater AC variant with a lot of standard features that gives its occupants a comfortable driving experience. This variant is blessed with an efficient air conditioning system, which keeps the cabin air regulated and is also equipped with a heater as well. The instrument cluster comes in amber illumination and is equipped with a few functions like a multi-tripmeter, a digital display with fuel level indicator, a digital odometer and low fuel warning light. Apart from these, it also has reclining front passenger seat along with sliding driver seat, integrated headrests for front row and an audio 1-DIN box with cover. Being the base variant, this multi purpose vehicle is bestowed with a few essential protective aspects, which gives the occupants a stress free driving experience. The list of features include headlamp leveling device, child lock for sliding doors and windows, both side external rear view mirrors and a centrally located high mounted stop lamp. The company has given it a full size spare wheel, which is affixed in the boot compartment with other tools required for changing a flat tyre. Apart from these, its rigid body structure comes with side impact beams that protect the occupants sitting inside in case of any crash or untoward incident. It also has seat belts for all passengers, which further enhances the safety in case of collision. 1. Spacious internal cabin with ample leg space. 2. Fuel economy is quite satisfying. 1. Exterior appearance needs to improve. 2. Lack of music system is a big minus. మారుతి ఈకో 5 వేర్వేరు రంగులలో అందుబాటులో ఉంది - Red, Silver, Gray, Blue, Black.